STOP Pulling Off The Ball, Increase Batting Average, and Boost Power By Using The Closed Stance? …But what I found in my research was counter-intuitive, yet very promising for hitters. My process is to chew and digest the science, observe how elite hitters apply the movements, and then try it out! As you’ll soon find out, Giancarlo Stanton did his homework before making this particular change in his swing. Analyzing the small change that has netted BIG results for Giancarlo Stanton this season. My good friend Seo Perales shared the above video with me a few years ago. By the way, he’s a multiple level black belt in Brazilian Jujitsu. We love comparing notes because we both like to seek and explore human movement principles that are validated by science. The only difference is, in his line of work as a Jujitsu instructor, he wants to learn how to break down the body, and I’m into maximizing its effect. The above video demonstrates the science of movement planes. What are considered weak and strong planes of movement from a Judo perspective. I think you’ll find the video enlightening. If you find yourself camped out in ONLY baseball or softball circles, then you’re missing out on A LOT of useful information that will take your hitters to a whole other level. The video is very applicable to hitting. He told me draw an “X” in the batter’s box from opposite corners, and have the hitter stand on either line when hitting. He’s very versed in Thomas Myers’s book Anatomy Trains . He says hitters standing on one diagonal leg of the “X” encourages the springiness of fascia. He taught this to his 15yo daughter, who has hit over .600 the last couple years playing Fast-Pitch Softball in Texas, which is one of the hotbeds for both baseball and softball competition in the country. Oh and by the way, she also hit a half dozen homers as well. The straw that broke the camel’s back for me in writing this post, came from this MLB.com article by David Adler titled, “Closing time: Stanton’s stance fueling surge: Marlins slugger’s home run tear lines up with change to batting stance in June”. Sounds contradictory doesn’t it? To have the attitude that you can’t completely change something in the middle of the season – especially when you’re already doing well!! But then he says you MUST commit to giving the change time – that is – IF you’ve done your homework beforehand. I’ve heard some parents and coaches say mid-season changes aren’t smart. I don’t like to think that way…WHY? Because if you don’t guide the hitter, the hitter will make changes on their own. And if they don’t get highly resourceful on the subject, then this could lead to DISASTER with all the junk hitting info on the net these days. “Stanton’s closing of his batting stance has correlated with his massive power surge. On June 18, he had 17 home runs in 282 plate appearances; since June 19, he has 28 in 236. When Stanton hits from those positions [open or straight up], his front side can come open before the pitch arrives, leaving him exploitable. I don’t care that Stanton is a beast, if you increase your Line Drive and Fly Ball Rates (Launch Angle), and Ball Exit Speeds that much, you’ll make a lot of Ground-ball teams VERY VERY upset. Small hitters CAN and DO take advantage of this formula too. Statcast has given hitters the cheat codes to increase offensive productivity! Look at that bold sentence once more because that is one of the most critical keys to this whole thing. Yelich is also tapping into making extreme adjustments, for example, Stanton’s challenge in the past has been pulling off, maybe because of when he tragically got hit in the face a few years ago. Whatever the reason, the extreme adjustment (a closed stance), helps him stay on the ball longer. CLICK HERE for a video I did on how to make adjustments…the scientific term for this is “Paradoxical Intention”. Some on Twitter have written this change off as a band-aide, avoiding a true fix. A true fix? Are you kidding me?! Cutting his home-run per plate appearance rate in half IS NOT a true fix!? Dude!! Success leaves clues. These people are saying Giancarlo Stanton is “playing to the slice”, where a golfer who chronically slices the ball will angle his body at setup so they don’t have to fix the real problem…which is not squaring up the club face at impact. This is a poor attempt to protect an inflexible teaching philosophy, and sheer laziness on their part to get educated on their craft they claim to know a lot about. You instructors seriously think Giancarlo Stanton is not “squaring the ball up” at impact since June 19th and is just “playing the slice”? That is laughable. You don’t know what you don’t know, right? This is the problem I have with instructors with inflexible hitting systems…they’re WILLFULLY IGNORANT to experimenting with things that could push their hitters forward, especially movements validated by science. We’re ALL in this together, and we’re ALL helping hitters. It’s NOT about your ego or protecting “your brand” coaches. I understand your objections that a closed stance may cut off a hitter’s vision, and/or restricts hip movement. You’ve heard me talk a lot about “keeping the back foot sideways”, well, this plays right into that. Matt Nokes is religious on restricting hip movement to the point of impact with keeping the back foot sideways. Homer Bush agrees in this interview. So are the Backspin Tee guys Taylor and Jarrett Gardner. LIGHT BULB! The closed stance does this naturally. The main benefit of restricting hip movement at impact (includes keeping back foot sideways) that you’ll hear from Nokes, Bush, and the Gardner Brothers, is to keep the barrel in the hitting zone longer. This increases BA and Slug%. If it doesn’t work after giving it the ol’ college try, then toss it. As many of you know, I will gladly eat crow and change my hitting system IF you can show me the science, swing experiments, and many elite hitting examples that I can’t ignore the issue. Interesting stuff. What are your thoughts on hitters setting up with an open stance and stepping to a closed stance as they swing? Seems like this would have the same effect. I agree, and this is what I’ve seen Jose Altuve do lately. Great article. Like a true scientist you are willing to follow the evidence even if it goes against past understanding. Unless I missed something…the evidence in the article is all correlative. Correlation does not prove causation. I have no problem with the change. If he was flying open too early then a closed stance would help him compensate and stay on the ball longer. There are other factors that could contribute to higher success however. Different pitchers, different stadiums, different time of day, different pitch locations, better pitch recognition due to improved vision developed over the course of the season, and perhaps even more…his mental game may have improved dramatically by that point in the season…and success hitting is largely mental. I am not discounting your article. Just pointing out that there are other variables to consider. One thing I have to struggle with now due this article: I teach slightly open to my young students who are not getting their hips through. Having them land slightly open (30deg) is an almost immediate cure. I suppose once they get the feeling and become successful I could put them back to a closed stance. One player had 20+ strikeouts in a row…I changed this (and worked BIG TIME on her mental game) and she had maybe 2 Ks in the next 30 ABs…had a 90% contact rate). So there is another correlation I could make…that landing open was the reason for her success. Hopefully I am making a valid point and not coming across as bashing. Thanks for all the info you continue to put out for us! Clint, you’re right! Absolutely. All those factors are…well, factors. Over time with a bigger sample sizes, we’ll find out more. I think with Stanton, the extreme adjustment was the ticket for him. I think a closed stance will help hitters that step out or pull off…OR, train hitters that step out, to stride in towards the plate, and most likely they’ll stride straight. They need to FEEL striding in, to get striding straight. Thanks for the kind words, and your constructive criticism wasn’t bashing, like some out there. Seems to me the closed stance puts you in show numbers position and by opening front foot on stride batter can get fascia stretch that way. You’re absolutely right on point there Dr. Hanson! I agree. If you look at Miguel Cabrera, who keeps his back foot sideways VERY WELL on all pitch locations, he starts with both toes pointing slightly towards the catcher, then he strides “open” (but it looks like the front foot is closed to a chest-view camera angle)…but if you look at where he starts with his closed feet, he lands open. I have been instructing my hitters to go from a slightly open stance (for stability) to a 10 degree closed stance per the hitting system. Are we talking about more than 10 degrees closed? Would the experiment be to go from an open stand ego a closed, then from closed to closed? Or would it be even to closed versus closed to closed? I don’t like it Joey. I feel it’s harder to control your direction. It’s harder for me to explain unless you followed my logic from previous comments… So for me you inherently cut the first swing down which is used for at least guidance and as thus have a harder time hitting across your face with your ribcage. I still prefer open to close….As for my foot… my foot is always around 65 degrees relative to my ankle….Now relative to my pelvis, hip or the plate depends on the pitch… I hope you get that….? I wonder if this stance was an adjustment of getting hit in the face…..
Last note… as to my feel… I’m a righty who’s left eye dominant… that can change how I direct my forces….somewhat ???? So what I don’t really like is his shoulder alignment but I guess he takes care of it by being knee deep in the ground… and he had an unbelievable tight coil. I like going into the ground than I go get the ball ( like a down and out)… it’s hard to explain …. I’m curious what you think…Thanks Joey. Joey for me… the open stance is already built in with your grip….. so when I’m open I’m actually not but it appears that way… so my lateral tilt is a product of getting my stance back to closed where the stance was already set… in some weird way. How could you forget Disco Dan Ford of the Angels and Orioles? (1) He never really closed his top half with an effective counter movement/rotation, taking his front shoulder down and in. Thus he was prone to flying open. (2) He didn’t tuck his back elbow in to his back side ribs but separated that back elbow early. Thus, he tended to hit around the ball. He still does that but closing off his front foot compensates for that, minimizing the negative consequences. See your presentations about centripetal and centrifugal forces. (3) He didn’t adjust his front elbow with the proper bend in his final turn to enable him to adjust to varying pitch planes. He says he patterned his new swing off of Adrian Beltre but he didn’t copy how Beltre utilizes house elbows. Reference your presentations on the law of the conservation of angular momentum. Keep in mind that Stanton is 6-6, 260. That can allow him to hit against his front leg. He just out “beasts” the damn ball. Can’t argue with the results. It works for him. But I think the statement in the article by his teammate Christian Yelich speaks volumes. “Some guys have different problems than others,” Yelich said. “You go about fixing them or covering them in different ways. It’s all about feel. That’s what works for him, that feel.” It works for Stanton. Shouldn’t work for Yelich too? It’s usually the lead hand that good players fail to use to make them great…And beginners use their top hand wrong…. The grip, neck and head along with the feet are always poorly understood…. I’m not disputing the closed stance activating facial lines. I’m sure there is a anatomical basis for Stanton’s recent success. However, I think if he did the things I mentioned in my last post, he wouldn’t have had to close himself off. Another thing, he stood very far from the plate, which is another cause of his difficulty with pitches away. Refer to past slo-motion swings of his on You Tube. If you are now advocating the closed stance approach, what becomes counter-rotational movement which engages the facial and muscular X pattern? Can you do both? Will there be enough time to do both? I like the discussion fellas. The video at the top of this post shows the power of motion planes to Stanton’s change that’s part of the science. The body’s use of fascial lines is much more effective when the springy X pattern can be engaged. 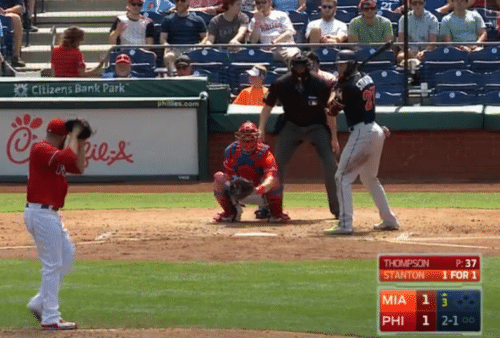 To answer your question Joe about Stanton being far off the plate, great observation…it’s because he’s 6’7″ and his reach is long compared to Andrew McCutchen or Jose Altuve, so he MUST stand off the plate so he doesn’t get “handcuffed”. The same can be said of Miggy, Judge, and Griffey Jr. The longer the wing span, the farther from the plate they must start. If you check his swing prior to the recent changes, he was far away from the plate. I feel that this was also a cause of his problem. Djura, you’re right on! He seems to be engaging the Catapult Loading System better in the new stance. After watching this video and reading your post I went to YouTube in an attempt to find other complete slow motion video of GS’s swing. I came across an interesting swing analysis that stated the his swing was completely level, parallel to the ground. When watching it does somewhat appear that way. However, on closer observation it appears that the shoulder tilt and bent back knee put the bat on a slightly upward swing path (ie. the pitch plane). The interesting thing to me is his powerful straight arm bat extension after contact. Its almost as if his “feel” is to keep the bat level which naturally forces good extension and keeps the bat on the pitch plane longer. You’re right on Michael! The term “level” is subjective and I wonder as to its definition when I hear online gurus use it. GS still uses his shoulders to get to differing pitch heights. Others say his swing is more Merry-Go-Round than Ferris Wheel. One swing at one pitch plane doesn’t make a hitter. If he was level to the ground, he’d never hit a pitch down in the zone. I guess video clips are like statistics – there are lies, damn lies, and then there are video clips of hitters. I think we better bring Max Scherzer into this conversation, if you saw how Scherzer dismantled Stanton’s swing last night. Haha Joe, yes, hitting a baseball consistently hard is THE hardest thing to do in any sport. Micheal, that extension is built in his swing… He holds it and moves around that point…The problem he has he just lets it go with the swing…. he’s suppose to trigger it for full control of that plane and use it as a guidance not a guess which is what he does… He should use that hold and lightly touch his direction… Badically he’s doing it out of sequence…. At best he’s pulling on the handle with his top hand towards the catcher but still this is not the first move…. So this is a control difference…. meaning he’s not using both hands to control the bat head…. Which he can get away with since he’s really big and does everything very well… For example, he gets a great coil and solidified really well (tight) and gets his feet really hard into the ground like he’s trying to move the EARTH…. For example we really should NOT say hands as one unit…. each hand has 3 major forces…. For example, as per my understanding and I may be wrong, the glutes are a 3 dimensional muscles and works in a plurality of angles… other leg muscles are not versatile…. Michael, his swing appears level because he has a really tight coil… I read an article way back that studied these angles… the article said if you can get the bat speed to around 102mph you will carry more if you swing level to the ground… To start… we swing in relation to our body not the ground… Tighter coil, more level… more importantly the swing is about pointing to your target and hitting it… If you do it all right your swing takes care of itself… Said another way, do think of the angles when you throw… up, flat or down…. My two cents but what do I know… I never played pro ? Joey, the more I think about it the more I’m coming around on Stanton adjustment to a certain extent…. It seems like he’s using his lead hand/forearm correctly but hard to tell…. My move which I labeled “Getting strong” was crazy BIG…. like I was about to kill something… I’m talking my first move… as my posture improves that first big move became calmer…my intention has not changed ONLY my standing or normal posture…. It’s all in the hands, feet and what smokers do ? It definitely helps to talk about it. Closing off has been on my mind for the past year or so. Interesting to play around with. Just to add another aspect of all this after seeing an overhead shot of Stanton last night on ESPN. He stands very far from the plate, on the back line and about 4 – 6 inches from the 3rd base sideline of the batter’s box. That’s pretty far from the plate! If he was to use a parallel stance and employ a straight ahead stance, he would never get the requisite plate coverage on pitches away. Thus, his prior difficulties. Not to disparage the fascial aspect of all this because I dont have the expertise to do so, but I can see why, from a purely baseball standpoint, he went to a closed stance. It was either that or move closer to the plate and keep his parallel stance and forward stride with a slightly open front foot (at least 45 degrees). So, I would caution instructors and coaches from teaching and hitters from employing a Stantonesque closed stance and stride into the plate. The body parts are linked – bent front knee, front shoulder, front elbow, flat palms, back arm angle, hinged back knee, back shoulder angle – all work to get a pitcher on pitch plane. Sorry, a hitter on pitch plane. The major thing I noticed was I couldn’t hit across my face in a controlled manner… We played 9 holes, again my first time playing… By the 7th hole I got it…. Again it relates to the lead hand/wrist/ forearm…. That’s what makes baseball so great – the variation in stances, swings, etc. I guess it becomes relative – to each his own. The quest for uniformity may be fruitless, though Joey did an article on that. I did Joe…yes, you go to a bowling alley and elect to put bumpers in the gutters, so you don’t embarrass yourself. Human movement principles validated by science are the bumpers…I don’t care what path the bowling takes down the lane, just as long as it stays between the bumpers. Between the lines are a hitter’s fingerprint, but the original “lines” MUST stay intact if the hitter is going to be successful at hitting the ball as hard and as far as possible. I’m not disagreeing with you and I meant no offense. I know you did that article. I believe there are universal principles that apply to all hitters, one of which is the separation between the upper and lower halves creating torque, which has been said to be the source of batspeed. However, you get guys like Stanton and his closed stance that take that separation out of the equation. Jose Altuve is another one. Joe, there are many different ways to skin a cat, however when you’re teaching young hitters, as young as 7yo, putting them in a no-stride isn’t very productive. For whatever reason my hitters are calling me a hitting magician. It’s not that there is magic involved, just human movement principles validated by science. Like you and others have said, big hitters can get away with things because of their size, but I think Stanton is onto something, namely because of the science. No offense was taken brother. I know you mean well. By the way have you heard anything regarding Thomas Myers? It would be interesting. What do you mean have I heard anything regarding Thomas Myers? You referring to doing an interview with him? I’m so busy I haven’t given it another thought. Someday for sure. I posted my comment on the “One Swing Fits All” article. That’s where it all started, I guess. Btw, I agree with all of those principles that Joey listed. It’s thst uniformity is hard to see in today’s hitters, though I think that the laws of human movement science would, more or less, require that. What we have is a “to each his own” scenario. I do not disagree. We’re on the same page. I heard John Smoltz being asked on MLB how he’d pitch to Stanton. He said, without hesitation, he’d run his fastball up and in and sliders away, of course. I think that guys with closed stances who come into the plate with their front foot are vulnerable up and in, and away. I’m a proponent of getting the separation between the upper and lower halves, utilizing a counter rotational movement of the front shoulder, creating the downward front shoulder angle, with a parallel stance and stride at least a 45 degree angle. Your fascia advocacy, along with the serape effect makes sense in this regard. That counter rotational movement conforms to the body’s anatomy. I’m stuck there, I guess, but Stanton doesn’t get that counter rotational movement. He’s kind of rigid and doesn’t stay connected with his hands. Rhys Hoskins’ minimal counter rotational movement is intriguing as guys like Miguel Cabrera can’t do that forever with age catching up. I like what Carlos Correa does. Carlos Gomez is textbook when he’s right and has his head screwed on. Andrew Benintendi is good and should be your new poster child for small guys. I agree Joe. All great points and yes Benintendi is great! So to sum it up, I feel like his gap is distorted based on his size and he would have a hard time triggering his swing for direction but since his posture is really good he can load that trigger to go with his swing… but ultimately he is throwing the bat head but since his trigger is loaded so well based on his posture he appears to be hitting not throwing… he is top hand dominate with incredible posture…. I agree Djura. Question, what are you doing to work on your posture? Last observation… he’s really tall so his strike zone changes but does it change in both direction and if not what advantages may that give him… just a thought! My son has put the closed swing to the test. Sample size isn’t that large yet, but his average has jumped and balls hit in the air have increased dramatically, (quality line drives and deep fly balls). He has never hit inside pitches better than he is now with the closed “Stanton” stance. It’s been four weeks of games and probably 8 batting cage sessions with the stance and he loves the results. He was a good hitter prior, but much better now. Power has increased too, prob added 20 feet to batted ball distance. Prior to using the “Stanton type stance” my son had his feet and toes inline prior to his stride. After stride he would probably be offset about 2 inches, with his front foot striding toward the plate. I would have to say his front foot is now offset about six prior to stride and reaching a 7 inch offset after stride. I will have to get an accurate measurement on that though. He is only twelve, so I just have him do what feels comfortable. With the closed stance I too notice that he shows his numbers and he shines the nob of his bat at the catchers feet with little effort. I think he is really getting his springy facia involved with his new stance. With his old, more traditional stance, he would have a difficult time getting the nob of his bat to shine on the catchers feet and i don’t think he adequately showed his numbers. I thought for sure with the closed stance he would have a problem turning on inside pitches. That is not the case at all. He is hitting inside pitches better than ever and still does good on the outside pitches too. It’s pretty awesome when you do a minor adjustment which feels better and more importantly substantial increases productivity…. By any chance does your son notice any difference in the lead shoulder. For example, does he notice more control of the lead shoulder or a sort of a slotting of the lead shoulder or lead elbow….Does the lead shoulder feel differently at all? And if you have time it would be awesome if you updated us with the results once you have a larger sample… I would be interested in contact ( strike outs and average) and the power number…. I will ask him about the front shoulder and elbow. I will also keep you posted on his stats, when I have a larger sample size. Give that young man a big high five for us Dave! If you ever notice I usually say either you have near perfect posture or can get yourself into perfect posture…. Please take a look at Altuve’s swing change this year. He may line up straight, but he takes his stride toward the 2nd baseman. This closes off his swing just as if he set up with a closed stance. Last year he was susceptible to the outside pitch, especially the slider. He backed off the plate a little bit and started striding toward the 2nd baseman. I think the results are evident with his MVP season. Totally! Can’t argue with his results in 2017.